It’s quite surprising that the Stone Temple Pilots, who have been knocking about for 20 years now, haven’t released a live video or DVD before. The show itself is a couple of years old, filmed in Chicago (no surprise, given the title) in March 2010. Some live DVD’s are memorable, and some are not so memorable. There’s AC/DC’s last one, which was beautifully put together, or Iron Maiden’s ‘En Vivo’. Then again, it could be argued that it all comes down to your love of the band. This is fair enough, but a casual interest in a band (like my own on STP) could be boosted by a top class performance and product. Alas, after sitting through this a few times it looks like it’s gonna be relegated to the ‘coaster’ pile. ‘Alive In The Windy City’ is not an exciting product. As is the norm with live DVDs these days the sound is first class, although the audience don’t get enough of a look in (although they are certainly heard), meaning it often sounds pretty much like a studio recording, mainly due to the band being very tight. There’s 18 songs spanning the band’s career pretty effectively, from opener ‘Vaseline’, through the likesof ‘Big Empty’ and ‘Trippin On A Hole In A Paper’. The stage is a reasonably small one, with some pretty cool backgrounds projected behind the band, and although Scott Weiland moves about a fair bit he doesn’t tend to interact with the crowd too much. The whole style and camerawork come over as a bit amateur compared to many other live shows I’ve seen, with a the colour a bit washed out for my tastes. 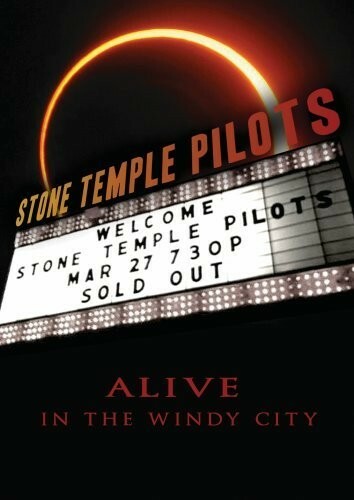 Musically, it’s STP with no surprises or revelations. After a few songs their grungeness gets grating, and after an hour you don’t really care about much any more. For a fan of the band, this should suffice as a live DVD, and I guess that’s who it’s aimed at. Even so, it’s not a great show, or even a great DVD. Then again, maybe this was the band at their absolute best. I don’t know, I just know that I’ve seen better.